Fill your glass with ice. Add a cup of ice to your cocktail shaker too, measuring the rest of the ingredients over the ice into the shaker. If you don't have a cocktail shaker, use a travel mug (it will keep the mix nicely sealed in as you shake, and will keep your drink cool just like a conventional shaker). Shake the drink, rattle the ice, and roll the drink until it's mixed. The best way to shake it is not by shaking back and forth or up and down. Much like your dentist told you when learning to brush your teeth, a round and round, circular motion works best (hence the 'roll'). This motion really gets the ice moving around and mixes the drink up better. It also keeps the cubes more intact, so they chill the drink rather than diluting it. Pour the finished drink into your glass through a cocktail strainer or a sieve, to catch any of the old ice used for mixing. 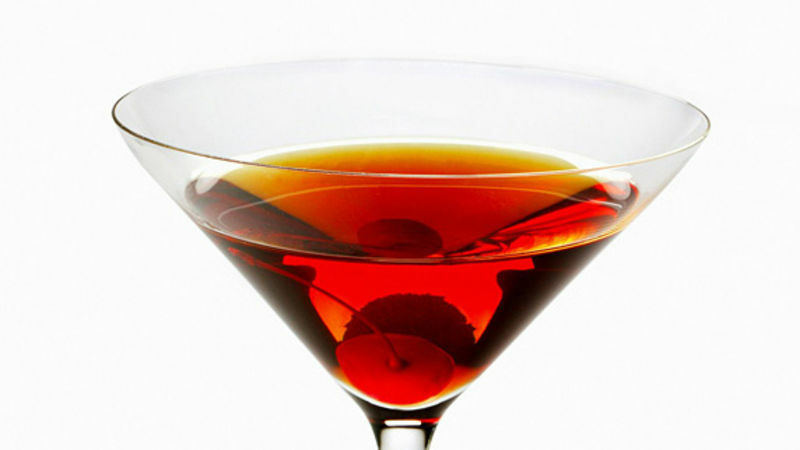 For the ultimate kitschy finish, add a maraschino cherry on a cocktail stick as a garnish.